Can you see me shouting ‘Hooray’ with joy, doing somersaults, grinning foolishly, being extremely happy in general? That’s because my four days of misery without the internet is over! When the guy from Airtel called up on our landline and informed us that the problem is fixed, I was so happy that I would have given my daughter in marriage to him! Well, lets say its a good thing for me (and the telephone guy) that I don’t have a daughter. Oh, How I missed seeing ‘No new messages’ on my mail box! I so really missed marking the promotional mails that fill up my inbox, as spam. God, life without the net is a real horror story, and a boring one at that too! The minute the net came, I sat in front of the laptop, to catch up with the huge bundle of emails I was sure I would have got. I wasn’t disappointed, the eBay, Shop Your World and other sites hadn’t forgotten me at all. They didn’t mind being ignored by me for the past couple of days. Ah…loved deleting them without even reading. So I am back to blogging too! 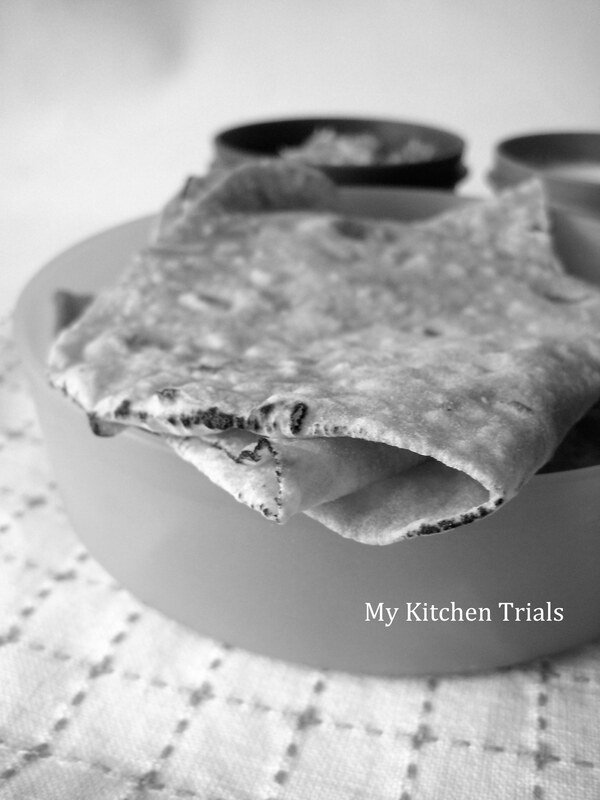 Here is my post for Srivalli’s Blogging Marathon which is entering the tenth edition now. I missed the first four days (no net, no post!). 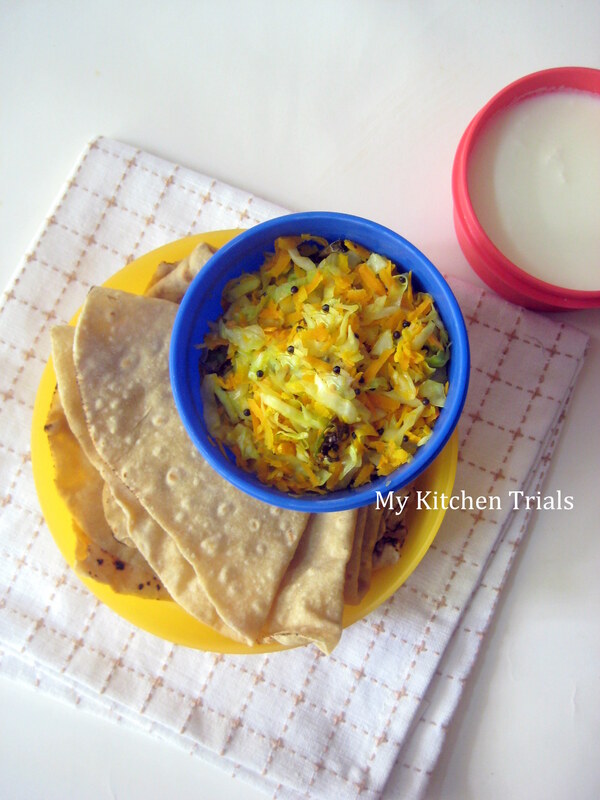 I have chosen the theme Lunch Box recipes, and here is my entry for the fifth day : Roti with a simple cabbage salad (Sambharo) and yogurt. 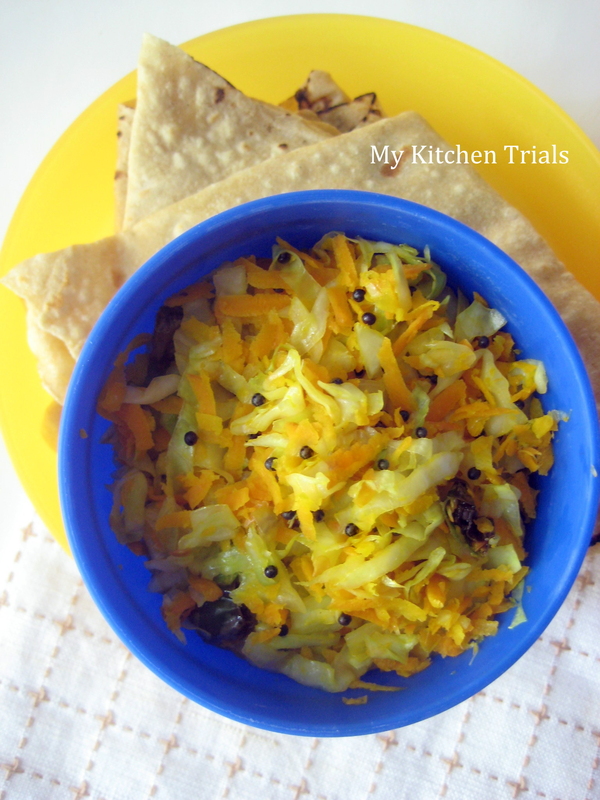 Microwave the shredded cabbage and carrot together for 3 minutes, till its 3/4th cooked. Heat oil in a pan, add the asafoetida, mustard seeds, curry leaves and green chillies. Once it all splutters, add the carrot cabbage mixture and salt. Cook for a minute or two till its all well blended. Take off the heat, add lemon juice. Check the seasonings and adjust. I packed this and a small bowl of yogurt as a side dish for rotis for hubby’s lunch. Wonderful to have you back, Rajani..lunchbox looks awesome..
Was wondering what happened to you? Glad to have you back Rajani. Missed your hilarious write ups. Good one..For me Internet is the life line!! omg i red ur post and i am like i can totally understand ur tragedy. i 2 get only spam emails day after day..
if only Internet goes and comes after 4 day in the past no, I wud have married off my sister to the airtel man. it will have been good on my brother in law lolzz..
now don’t you start giving ideas to harish! loved reading ur posts,. and like the new look of ur blog too :-) looks fab !